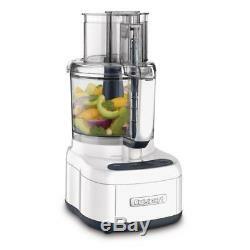 Cuisinart Kitchen Food Processor Stainless Steel Blade 11 Cup Glossy White New. The Cuisinart Elemental 11 Food Processor allows users to quickly and easily prep larger portions of ingredients for bigger meals. With an 11-cup work bowl, 1 stainless steel blade and 2 discs, its the ultimate time saver, making quick work of everything from chopping nuts and pureeing soup to slicing tomatoes and shredding cheese. The rubberized touchpad with Pulse control offers the ease of use and versatility that makes this classic the favorite of creative home cooks. Exclusive patent-pending SealTight Advantage system seals bowl and locks blade. Supreme wide mouth feed tube accommodates whole fruits and vegetables. Powerful performance for everyday food prep tasks. Reversible shredding disc medium to fine. Convenient rubberized controls high, low, off and pulse. Easy-to-clean removable parts are dishwasher safe. Small Electric Product Type: Food Processor. This item is covered under a. When returning an item, it must be in all of the original packaging and include all of the original accessories or items that came with it. The item and package should be in its original perfect condition. We are extremely fair and we will gladly work with you to find a solution. We take our reputation seriously so we understand the value of trust. And we will work with you to resolve it to your satisfaction. 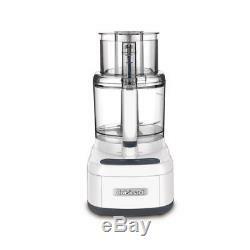 The item "Cuisinart Kitchen Food Processor Stainless Steel Blade 11 Cup Glossy White New" is in sale since Thursday, October 05, 2017. This item is in the category "Home & Garden\Kitchen, Dining & Bar\Small Kitchen Appliances\Food Processors". The seller is "homedeals2919" and is located in Multiple Locations. This item can be shipped to United States, Canada, United Kingdom, Denmark, Romania, Slovakia, Bulgaria, Czech republic, Finland, Hungary, Latvia, Lithuania, Malta, Estonia, Australia, Greece, Portugal, Cyprus, Slovenia, Japan, China, Sweden, South Korea, Indonesia, Taiwan, South africa, Thailand, Belgium, France, Hong Kong, Ireland, Netherlands, Poland, Spain, Italy, Germany, Austria, Israel, Mexico, New Zealand, Philippines, Singapore, Switzerland, Norway, Saudi arabia, Ukraine, United arab emirates, Qatar, Kuwait, Bahrain, Croatia, Malaysia, Brazil, Chile, Colombia, Costa rica, Dominican republic, Panama, Trinidad and tobago, Guatemala, El salvador, Honduras, Jamaica.